Someone asks me to write my views about the validity of Anglican Holy Orders. I could, of course defend their validity from the time of the Reformation till today with the sound arguments so many have used against the Papal Encyclical which pronounced them totally null and void. Which, of course, is why the RCs reordain Anglican priests who change Churches. But all this is now quite unnecessary, since – at least in the UK – most Bishops were consecrated with Old Catholic bishops being co-consecrators. The RC Church recognizes the validity of Old Catholic orders, so there is no reason now to deny the validity of Anglican bishops and priests whose consecration or ordination was by bishops in the Old Catholic succession. I have been to the consecration of several Scottish Episcopalian bishops, all of whom had an Old Catholic bishop, who (as is their custom) laid hands on the new bishop separately, rather than in the usual Anglican “scrum”. So, since I was ordained by one such Episcopalian bishop, my orders are as “valid” as any Old Catholic or RC priest’s. Not that I have ever lost a wink of sleep over this question – a God who paid any attention to such a weird view of what makes a priest valid would be a queer fish! The problem is with the Anglican ordinal unless it has been changed to conform to Catholic rather than Protestant norms of faith. Even if Old Catholic bishops participated in the consecration of Anglican bishops, the consecration would be invalid if it were done using the Edwardine Ordinal because it lacks the proper Catholic form found in the pre-Reformation ordinals. The question then becomes, were the Anglican bishops consecrated using an Old Catholic or Anglican formula? If it is the former then the orders would be valid — the latter not so. Also, how could say a Low Church Anglican bishop who rejects the Catholic understanding of the priesthood be able to have the proper intent? I’m afraid, if using the pre-Reformation ordinals were necessary t convey valid orders, then the Pope himself would be invalid plus all the Eastern patriarchs. It was a long time before the Church had a recognisable written ordinal, as any liturgical scholar will testify. For all I know, maybe one of the “Anglican treasures” the new RC Anglican use will preserve will be the Prayer Book ordinal. The intention of the Church of England was always to continue the ancient order and understanding of bishop, priest and deacon. Knowing the heretical teachings of the of those who invented the Anglican Rites of “ordination,” not only is it clear beyond doubt that they had no intention to continue the Catholic meaning of the office of bishop, priest or deacon, but it was their intent to exclude such meaning from their man made heretical rites. 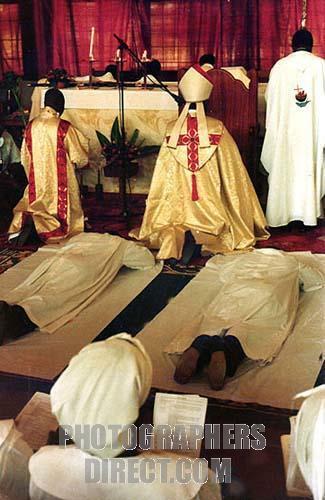 To those who have been “ordained” in such rites please know from the Catholic point of view you are laymen. Bread remains bread and wine remains wine, for neither Parliament nor “good” Queen Bess. had the power to make priests! What a quaint, old-fashioned view! And such a sad view of God our Father. See my previous reply. One of the attractions to me of the Anglican Church is the lack of authoritarian certainties such as Rome and the Orthodox and the Southern Baptists etc have – and their certainties are all different! God can cope with us all, I’m sure. But all this is now quite unnecessary, since – at least in the UK – most Bishops were consecrated with Old Catholic bishops being co-consecrators. The bolded part is probably why each case will be individually assessed for those who wish to join the ordinariate and why there won’t be a corporate reunion. The issue in the United States is certainly more complicated with female bishops, and I think more indirectly by the agreement of full communion with the Evangelical Lutheran Church. Didn’t the Old Catholics use their own formula of Accipe Spiritum Sanctum as they placed hands on the new Anglican bishops? Indeed the new Roman Ordinal omits a formula during the actual laying on of hands. It’s certainly not a matter of,eh, hocus pocus. Also 1662 corrected many of the problems connected with the Edwardine Ordinal. As the late Cardinal Hume said to one of my friends who was once an Anglican Ordained Minister but is now a Catholic Priest in the Diocese of Westminster. At the end of the day, we don’t know who Anglicans are and unfortunately neither does the Anglican Church, I think that real progress can only be made once you sit down Philip Jensen, John Spong, John Broadhurst, Rowan Williams, Katherine Schori and Peter Akinola and agree on what an Anglican is. Well, well, i have never doubted the validity of my orders as an Anglican Priest!!!!!! the theology of ordination;say the Medieval Pontificals!!! pre reformation rites, to an earlier time, is silly!!!!!! theology develops over time as we know. At one time it was seriously thought the essential matter and form was the presentation of instruments;no one would hold that view currently. Ignatz von Dollinhger always believed in the validity of Anglican orders, simply because, the essential was there the laying on of hands with prayer with the intention of ordaining ,setting aside someone for a specific office of ministry whether Bishop, Priest or Deacon, by a Bishop. If ROME seriously thinks that, a specific formula or specific words or particular reference to a theological idea stated(ie actual words) or implied in a rite makes it valid, then no one would have validly been made a deacon, ordained a Priest or Consecrated a Bishop, simply because these implied theological concepts or actual words are not in all early rites or all later ones. Simply put, whether Anglican Orders are valid from Romes perspective, is not to do with whether they are valid or not!!!!! !SIC but whether they say they are!!!!!! when reffering to Eucharistic Presence, not pre reformation or medieval views of the Eucharist .